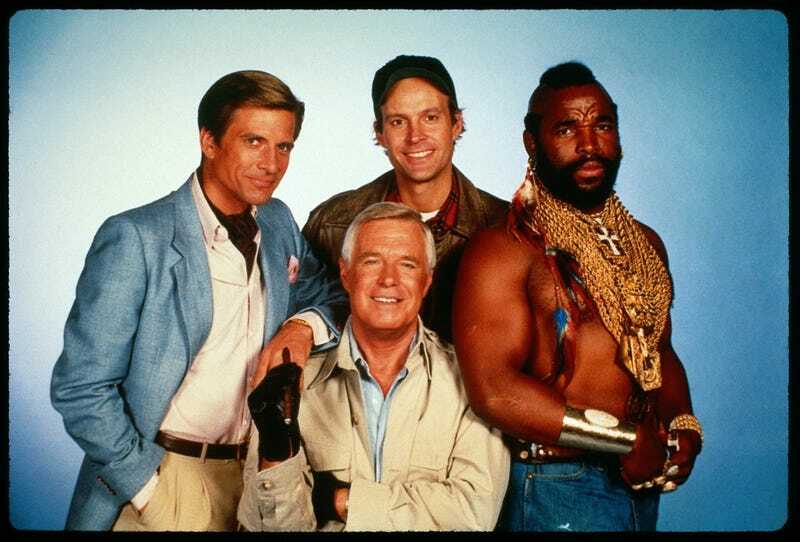 The A-Team is one of the most enjoyably awesome tv shows ever made. Me and my dad used to watch re-runs of it every morning before I went to school. I just learned that it was on Netflix. So obviously that means it was time for a marathon. Some random musings. -They straight up lie in the opening monologue. They did actually rob the Bank of Hanoi, it's just that the documentation condoning it was destroyed. - What does the "Los Angeles underground" mean? - Mr. T is awesome. But that's a given. - We all know what B.A. actually stands for. - We never see B.A. actually pick anyone up before he throws them. - I always groan whenever Hannibal says 'I love it when a plan comes together". - I also groan whenever they say the name of the episode in the episode. But that isn't unique to just the A-Team. - Is Murdoch actually crazy or is it supposed to all be an act? Either way Dwight Schultz does a great job. - Also, Murdoch is hilarious. - For wanted mercenaries it sure is easy for people who aren't the military to find them. - Shouldn't Amy Allen be wanted by the military as well before she goes off on her "foreign correspondence"? It's well known by Lynch and Decker that she works with the A-Team. She's even held people at gun point. - It's incredibly odd that every badguy group has access to a helicopter in the first season. - I get more excited during the part of the episode where they prepare for the bad guys to attack / to attack the bad guys than I do for the actual attack. - What was their car budget? At least 5 cars seem to get completely totaled every episode. - The A-Team van sometimes doesn't have a sunroof in a scene and then will have one in a later scene (or vice-versa). Also, I want that van.